Take a holiday stroll through Christmas in Old New York! Macy’s Herald Square: the inspiration of Miracle on 34th Street and birthplace of many holiday shopping traditions. 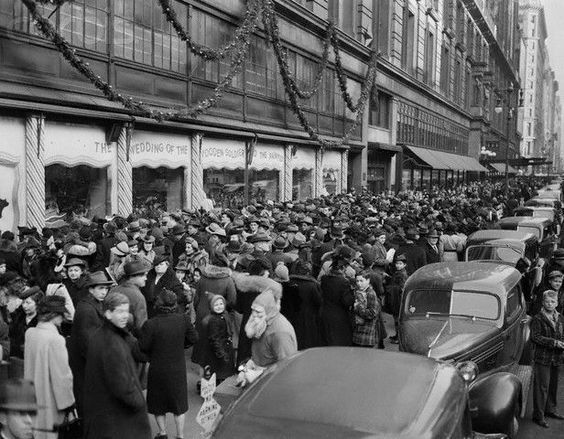 Lord & Taylor: site of the world’s first animated Christmas windows. A beloved NYC Christmas tradition, this is the final season for the department store and its remarkable tableaux. Hear how NYC’s writers, artists, and immigrants created countless American holiday traditions, including Christmas trees, classic Christmas songs, and the ubiquitous jolly Santa Claus. Bryant Park: a stop at the park’s Winter Village to marvel at the glittering scene (and learn about the park’s sordid past). We’ll visit the center of the city’s holiday celebration – Rockefeller Center. We’ll explore the roots of traditions like Sak’s Fifth Avenue’s animated windows (also in their final season), the dazzling Channel Gardens decorations, the towering Rock Center Christmas Tree, FAO Schwarz Toy Store, Radio City Music Hall & the Rockettes. Join us to explore New York’s historic Christmas tales, traditions, and contemporary holiday spectacles, demonstrating why NYC is America’s quintessential holiday destination.